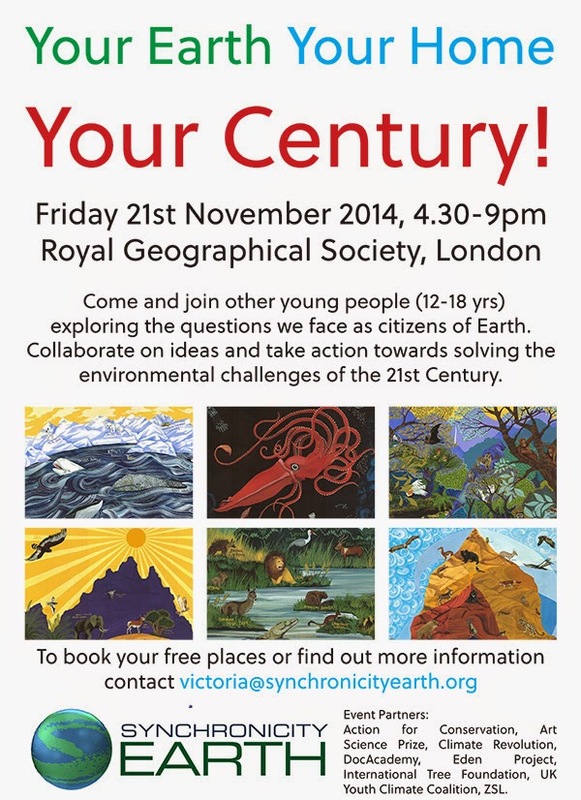 On Friday 21st November, 2014, 200 young people will go on a journey across continents, exploring environmental problems and their solutions. The event will cover many curriculum areas within Key Stages 3-5, from Geography and Sciences to Art and PHSE. The event and pre-event activity will enrich learning, particularly in the spaces between ‘art’ and ‘science’, promoting a multi-disciplinary approach and showing young people that their actions are meaningful and have purpose and that with the right knowledge, they can shape the future. Before the journey begins, Synchronicity Earth and event partners will provide ‘discovery kits’ to participating schools, clubs, individuals and groups. These will offer ways of understanding why the planet is incredible and what is happening to its ecosystems – e.g., resource depletion, pollution, climate change, species loss – via film, debate and guided activity. These kits can be incorporated within lesson plans or used independently. On completion of this preparatory work, young people who have signed up to Your Century! will be able to pre-select the three workshops – out of a choice of 18 – that they wish to attend at the event. The event will begin with an introduction from an ‘Elder’ – someone who has who has explored the natural world and witnessed human impacts and who wants to inspire young people to protect life on Earth. Within the two workshops that follow, young people will be able to explore in more detail the problems facing the planet, guided by facilitators who will help them to discuss their thoughts and feelings. These sessions will be a cross between a TED talk and a passionate conversation and may include Skype-links with young people in sub-Saharan Africa, Southeast Asia and beyond. The final workshop will help young people to develop skills (spoken/written word; campaigning; music/theatre; art) that will help them to make a difference beyond the event. At the closing session of Your Century! workshop representatives will present the ideas that most inspired them and the challenges they would most like to overcome. These will be collated into a declaration that will remind participants that this is their time and they are part of a wider network of people working towards a more responsible human culture. We will support young people and their guides to bring the conversation back to their schools, youth groups and communities, developing a continued learning process which will enable ideas to become a reality.